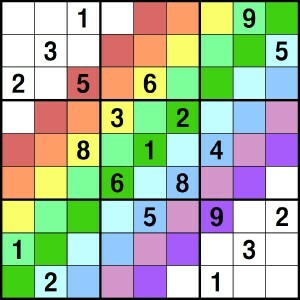 In this variation there is one extra full Sudoku region (where 1--9 each appear exactly once) and eight extra partial Sudoku regions (where no number is repeated). 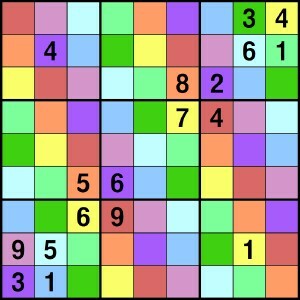 The numbers 1--9 must each appear exactly once in each row, column, and block, and there can be no repeated entries in any of the color regions. This is an original Brainfreeze variation. This example of Simple Rainbow has difficulty level 2 out of 3. Tip: All your usual Sudoku techniques will apply here. When you get stuck, use the extra color conditions. The larger regions are most useful, especially the center three diagonals. This puzzle is like the previous variation, except all nine extra regions will contain all of the numbers 1--9. Notice that the regions wrap around the puzzle to the other side when they get to the edge. (Mathematical note: This means that we are thinking of the diagonal regions as lying on a torus.) The numbers 1--9 must each appear exactly once in each row, column, block, and color. This is an original Brainfreeze variation. This example of Wrap Around has difficulty level 1 out of 3. Tip: Use the color regions as much as possible, and try to incorporate the diagonals into your scanning techniques. It is often useful to consider each diagonal color region one at a time, looking for instances where only one number can go in a particular cell of that diagonal. Again we have nine extra Sudoku regions (which in math-speak means that we have a multiple Gerechte design), but this time the regions are totally disconnected. The numbers 1--9 must each appear exactly once in each row, column, block, and color. This example of Positions has difficulty level 2 out of 3. Tip: Notice the colors appear in a regular pattern: a particular color will appear in the same location in every block of the puzzle. Keeping this property in mind can help you see these regions better; each color region is kind of like an exploded block region. 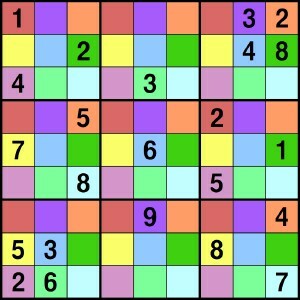 As in the Positions variation, there are nine extra disconnected Sudoku regions indicated by color, but with a different pattern. 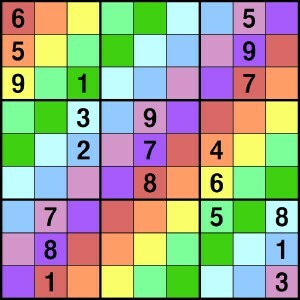 The numbers 1--9 must each appear exactly once in each row, column, block, and color. This is an original Brainfreeze variation. This example of Rainbow Shift has difficulty level 2 out of 3. Tip: By following the pattern in the design, you can see the color regions as exploded wrapping diagonals. 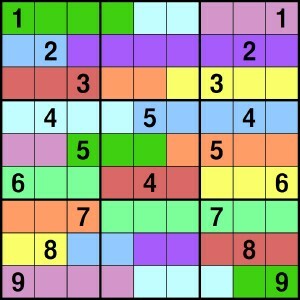 Use your normal Sudoku techniques, and those you developed for the Positions and Wrap Around variations. This is perhaps our most brain-freezing variation, because the rows in this puzzle are not Sudoku regions; they have been replaced with broken rows, indicated by color. The numbers 1--9 must each appear exactly once in each column, block, and color (but not row). This is an original Brainfreeze variation, and we apologize for making your brain hurt when you play this puzzle. This example of Stripes has difficulty level 3 out of 3. Tip: The easiest broken rows to deal with are those that intersect each column of the puzzles, since these are rows that have been broken and had their pieces shifted straight up or down (for example the red broken row in the puzzle to the left). On the other hand, the broken rows with pieces that lie over one another can often provide more useful information (for example the light purple broken row).